If you have trouble watching the above video, click here for instructions. On a quiet Sunday afternoon in the Dutch countryside, we imagined to find a well deserved rest after a week of hard work, at our daughter’s riding stables.... But no...!! Each year in June, the local youth community located just a mile away, has their annual ‘coffee concert’. 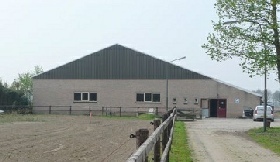 For 35 years in a row, the Dutch farmers rock band ‘Normaal’ performs here. 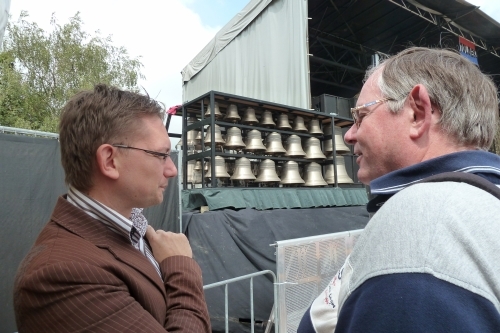 Today they invited Frank Steijns and his mobile carillon to be their special guest. Is it Bronze and heavy metal together? Yes, it is possible. The farmers custom is to throw beer into the audience. Since I was standing in front of the crowd I was only hit three times: twice on my back by (plastic) glasses of beer and once in the face by a single glass of Cola. The latter was from a kid in front of me, returning the ‘actions’ of his mother, who was standing next to me. Once in a while she threw beer at him! Well, as city people we had a completely new experience attending this countryside pop concert! The band “Normaal” with the lead singer Bennie Jolink, is a well known (farmers) rock band in The Netherlands with many hits, sung in dialect. The band members live a few miles further down the road. Frequently you see the word ‘Høken’, which is the local dialect for ‘having fun’. Enjoy!